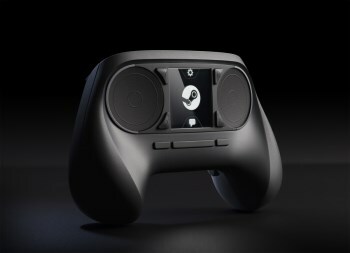 The third and final big announcement out of Valve is the Steam Controller, a gamepad that forgoes thumbsticks for two high-resolution trackpads. This is what it's all built up to: The Steam Controller, a device Valve calls "a different kind of gamepad" that will work with every game on Steam, even those that don't offer controller support, by emulating mouse and keyboard operation. While the basic shape is that of a conventional controller, it's unquestionably unusual: in place of the sticks you'd normally bop around with your thumbs, the Steam Controller offers a pair of high-resolution trackpads that Valve says will make everything accessible from the couch. "The Steam Controller is built around a new generation of super-precise haptic feedback, employing dual linear resonant actuators," the controller page states. "These small, strong, weighted electro-magnets are attached to each of the dual trackpads. They are capable of delivering a wide range of force and vibration, allowing precise control over frequency, amplitude, and direction of movement." And what exactly does all that mean? Apparently this: "This haptic capability provides a vital channel of information to the player - delivering in-game information about speed, boundaries, thresholds, textures, action confirmations, or any other events about which game designers want players to be aware. It is a higher-bandwidth haptic information channel than exists in any other consumer product that we know of. As a parlour trick they can even play audio waveforms and function as speakers." There's also a touch screen located between the trackpads, which will automatically overlay its display on the big screen so you won't have to look down from the game, and course buttons - 16 in all. Support for older games will come by way of the "legacy mode" configuration tool, with which the Steam community can create and share button bindings for any games they like. And that wraps up Valve's announcement extravaganza week! An operating system, some boxes and a controller - was it everything you'd hoped? Full details about the Steam Controller, and everything else Valve talked about this week, can be found at steampowered.com/livingroom.